Supplying all types of certified stone nationwide, Castlegannon Quarry in Mullinavat, Co Kilkenny has had as good an opening year in business that an Irish quarry could ask for. Indeed business is good down in Castlegannon and the company’s partners James Meaney and Shay Malone wouldn’t have it any other way, having started up his venture some 12 months ago with the intention of growing it month to month. 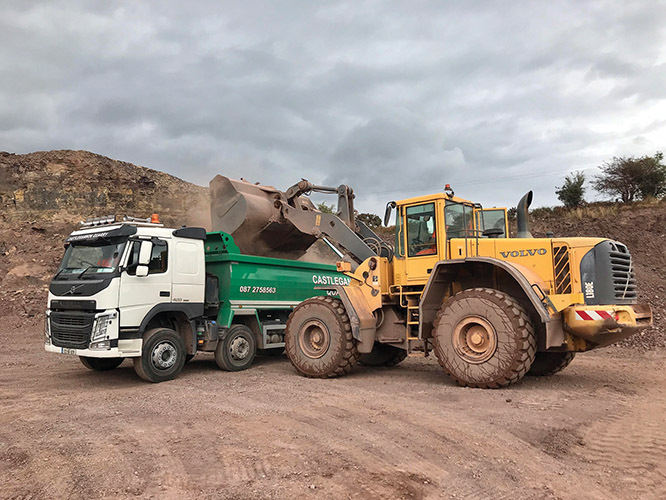 The two men have been immersed in the company from the outset and today Castlegannon Quarry is operating with two trucks from its base – the latest being a new Volvo FMX13 420 8 x 4 Fitzgerald Tipper. It’s a vehicle with excellent specification vehicle for the construction sector and N3G category makes it ideal for heavy site work. For Shay Malone, the plan has come together nicely so far and he took some time recently from what has become an increasingly busy schedule to fill Irish Trucker in on what his business is all about. 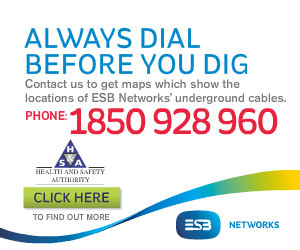 “We’re in Castlegannon, Mullinavat, Co Kilkenny and the business itself is up and running 12 months now,” Shay explained. The N25 New Ross is set improve regional, national and international connectivity on the N25 Cork to Rosslare, linking the N25 with the N30 New Ross to Enniscorthy route. Work on the bypass will involve 15km of road works. The job was very much a timely one for Castlegannon Quarry, with James and Shay just having got up and running when the opportunity with BAM presented itself. As aforementioned, a second truck has been added to the fleet and both are flat-out on the road at the present time between a handful of different projects which are on-going. “Business is fairly good at the moment. We’ve started on a few different projects,” said Shay. Shay’s working background had very much been in Plant Hire and construction before taking the decision to start up in Castlegannon. During those years he built up the experience necessary to immerse himself into eventually running a venture which supplies certified stone nationwide. While felt there was a niche in the market around Kilkenny, he also admits that the timing has been fortunate in order for him to be able to call the first 12 months of Castlegannon Quarry a resounding success. “I was always involved in Plant Hire and then went into the construction industry,” Shay stated. And the plan is to keep up their endeavours into ‘Year Two’ at Castlegannon Quarry, with more and more growth very much on the agenda as the construction industry continues to boom all over the south east and, in particular, Dublin. If you were to ask Shay what the secret has been thus far, he’d put it plainly in that a lot of it has come down to competitive pricing and convenience for customers. “Maybe the reason things are going well for is because the reasonable rates that we have here are reasonable. That and the fact that we’re close by for a lot of our clients,” he stated. You can be sure that the fleet, as well as the staff numbers, will grow at Castlegannon Quarry in 2019 but, for now, they’re taking it day by day at this firm which is very much still finding its feet. Of course, the long-term aim is continued growth and expansion both James and Shay aren’t men to get too far ahead of himself too quickly, despite his new company’s rise in the space of just 12 months. “We’ll probably add another truck at Christmas but, as the fella says, ‘walk before you can run’,” Shay concluded.